Answer: Should I be worried about this fish? WHILE diving in the Somosomo Strait on September 8th of this year, I found this fish down at 10m, busily picking up chunks of coral and moving them from place to place. The question for this week was "Should I be worried about this fish?" You SearchResearchers did an excellent job of answering the questions. 1. What IS this fish, and should I worry about it being aggressive? 2. If so, WHEN should I worry? Everyday? Or just sometimes? 3. Should I have been worried on the day I took the photo? 1. How can we identify a random fish like this? 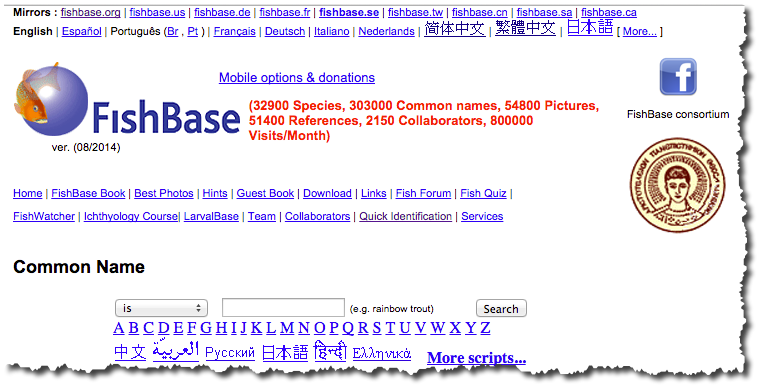 which led me to Fishbase.org which has a really extensive index AND a great key system. They're pretty serious about their fish. Here's a piece of their home page. I immediately noticed the "Quick Identification" link and clicked on that. 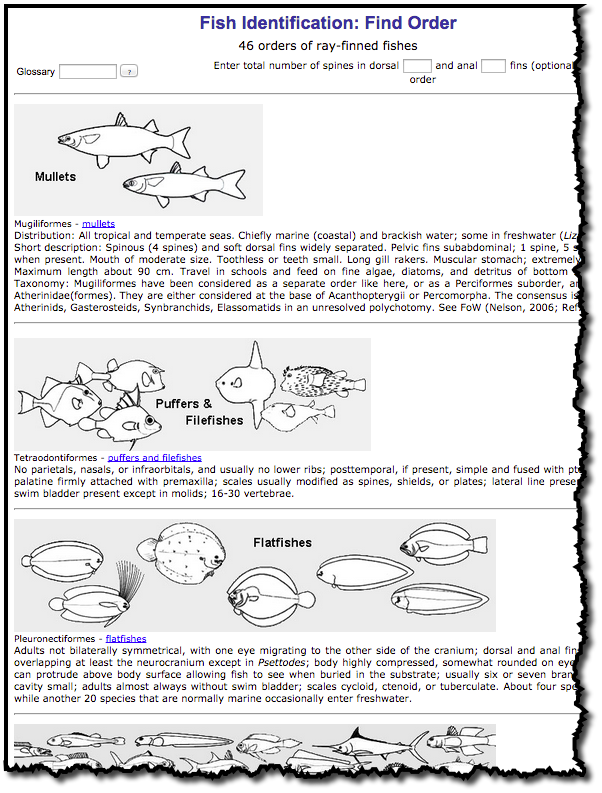 Now at this point, I MIGHT click on "Puffers and Filefishes" (the same of the mystery fish looks pretty much like the fish on the far left of that category), or I might scroll down and click on "Dories" farther down the page. But "Dories" are, as the note down there says, "most are deep sea." So I'll click on "Puffers and Filefishes" and see what's there. So we've identified our fish. Now, is it aggressive? Let's do this search to see if we can find anything out about the behavior of the Titan triggerfish. Note that I didn't search for "aggressive" here--that's just ASKING for confirmation. Instead, I searched for "behavior" because maybe it's perfectly passive 99% of the time, and rarely aggressive. If I searched for "aggressive," I'd be sure to find every single page talking about it's aggressive tendencies. It would be a fair research question. When I did this I was slightly surprised to learn that (despite me trying to be fair), the Titan triggerfish HAS been observed being fairly aggressive to other fish (and humans) who enter their territory. 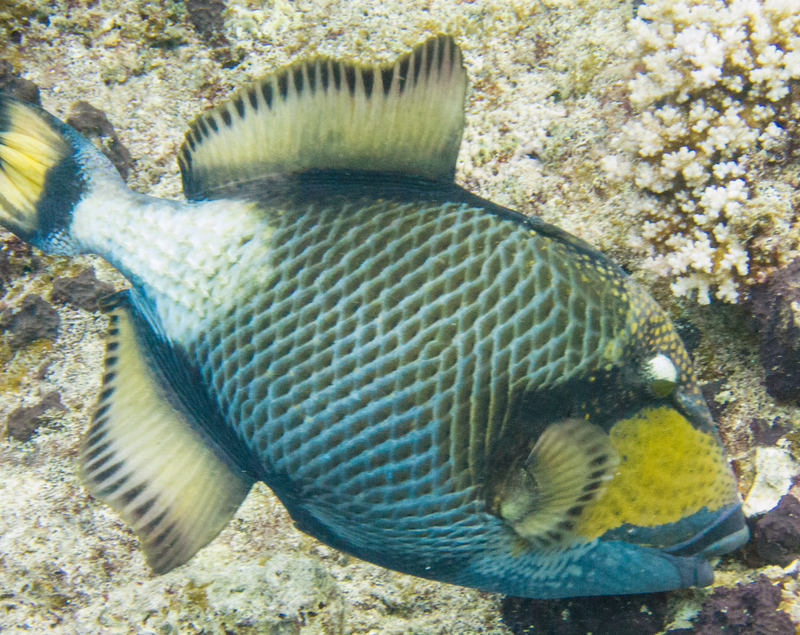 The Wikipedia Titan triggerfish article says that "...The titan triggerfish is usually wary of divers and snorkelers, but during the reproduction season the female guards its nest, which is placed in a flat sandy area, vigorously against any intruders. The territory around the nest is roughly cone-shaped and divers who accidentally enter it may be attacked. 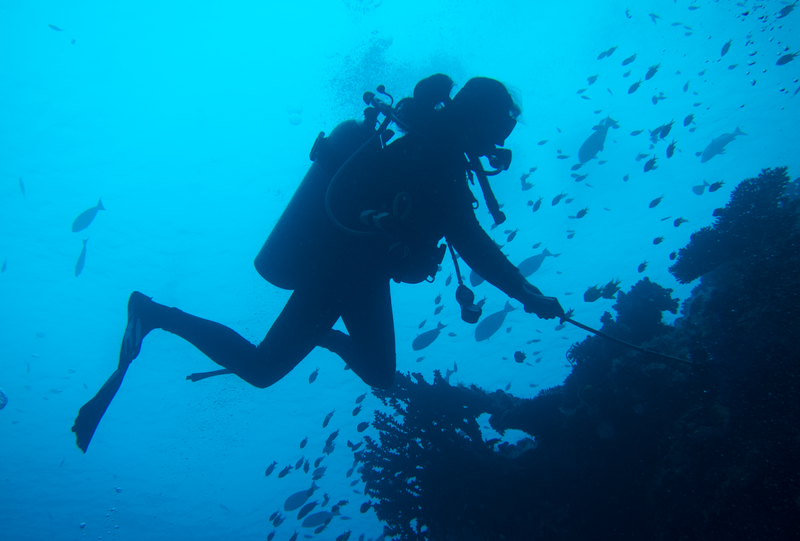 Divers should swim horizontally away from the nest rather than upwards which would only take them further into the territory. Although bites are not venomous, the strong teeth can inflict serious injury that may require medical attention..."
Zounds! As you can see from the photos, any fish with teeth like (who bites coral!) would have an impressive bite. Okay. 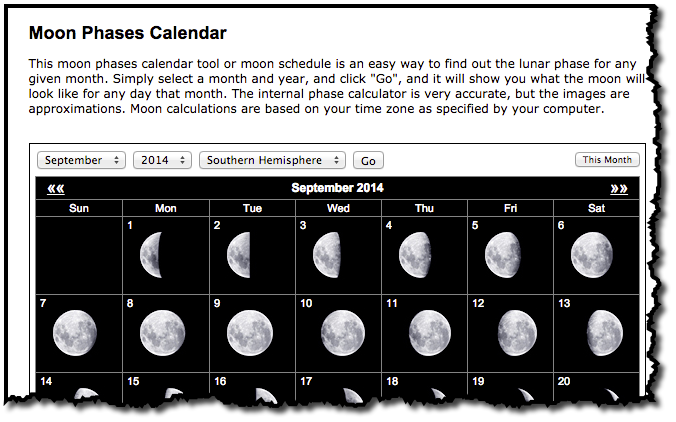 So the question NOW is "was Sept 8 near a new or full moon when a high tide was near sunset?" The second and fourth columns are the high tide times. Holy cow! 5:46PM was the high tide AND sunset was just 15 minutes later at 6:00PM FJT! So YES... I should be careful! 1. Know the geography. In this case, fish look very much alike, but can be different worldwide. Knowing that Somosomo Strait is in Fiji really helps. 2. Use an identification key. There are keys for fish, plants, animals, insects, fungi, flowers, etc etc. Know that a good key is almost always the best approach for identifying something. 3. 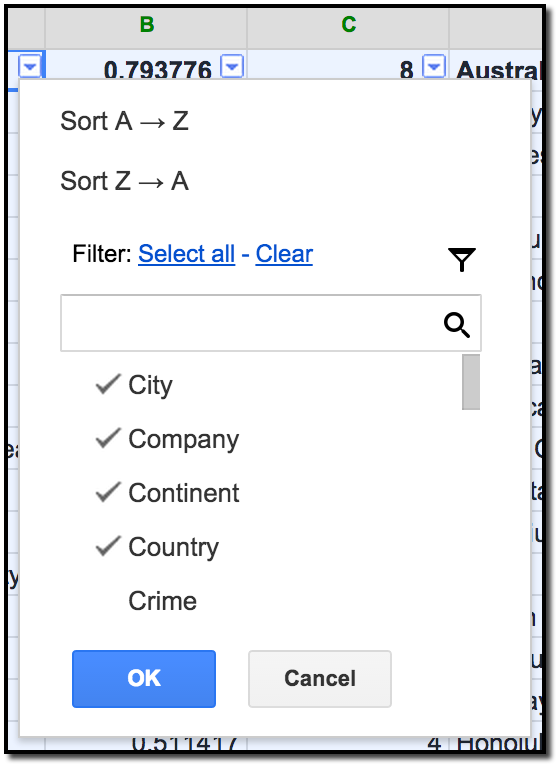 Do not bias the results by including "leading terms" in your query. In this case, the Titan triggerfish really IS aggressive, but don't search for trouble to begin with. Let the data guide you to that interpretation--don't overlimit you search results to only those with evidence that confirms your already existing biases. Note: Rosemary made a great observation about using Search-By-Image for this Challenge. It's such an interesting finding that I'll write a separate post about that. Gladstone, William. "Lek-like spawning, parental care and mating periodicity of the triggerfishPseudobalistes flavimarginatus (Balistidae)." 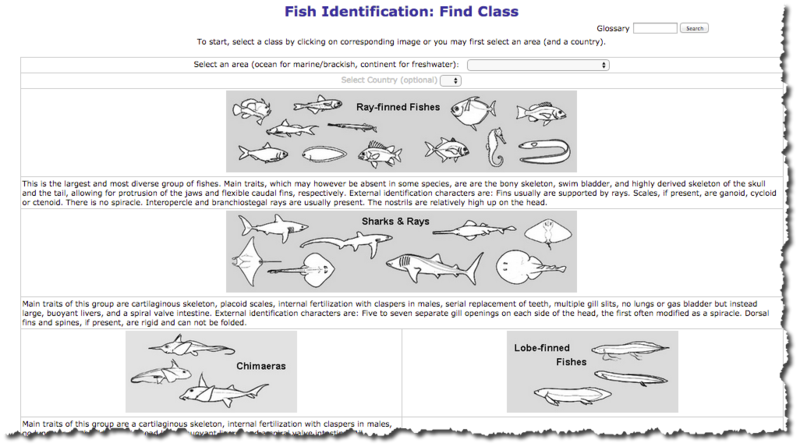 Environmental Biology of Fishes 39.3 (1994): 249-257. 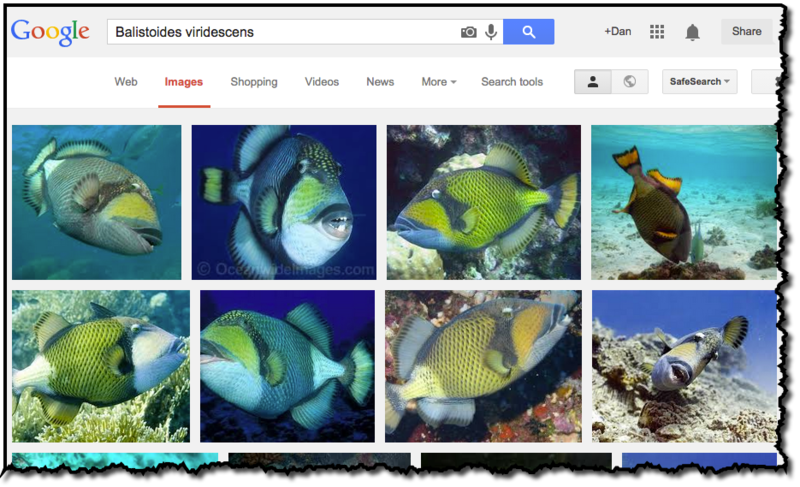 Search Challenge (9/24/14): Should I be worried about this fish? It's a pretty big fish, around 70 cm / 27 inches tip to tail (and the chunks of coral it was moving were the size of my dive buddy's fist). The teeth on this thing are also impressive, and seeing what it could do to coral makes me think that I'd prefer to not tangle with this fish. As always, be sure to tell us what you did to answer the Challenge, and how you figured it out. P.S. I'll get back to the Twain place-names tomorrow. It's been an overly busy week, unfortunately. Sorry folks... this really hasn't been my week at all. After coming back from my dive trip, I'm still working through the tail-end of my cold/flu thing, while simultaneously trying to get a bunch of unexpected things done at work. Usually I can just get up earlier in the morning and get my SRS writing done, but this week I just couldn't quite pull it off. Luckily, the weekend is coming, and I'll catch up on this long conversation on Monday. More maps, more analysis, more information. Have a great weekend! See you then. Answer (Part 1) to: Can you find the places Twain mentions in "Around the Equator"? I have to start off by saying that this really is a complicated and difficult challenge. But the SRSers rose to the challenge. Answering this is slightly complicated as well, so I'm going to write this up in two (or three) parts. Here's installment #1, which is really a story of how to keep digging in, learning things along the way, and finally coming up with something that works. Entity identification in arbitrary text. 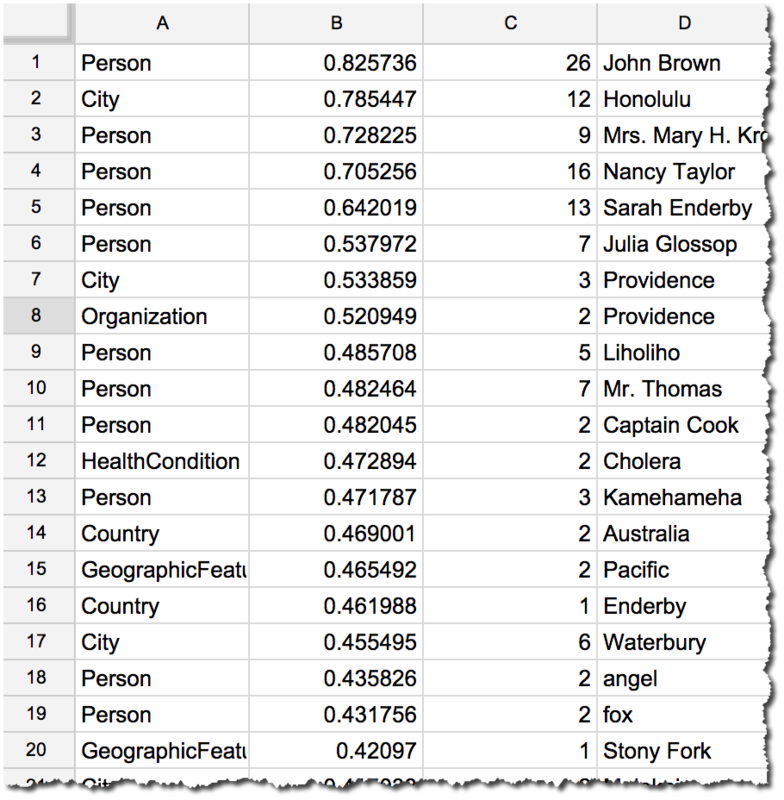 When I sat down to do this Challenge I had an advantage--I already knew about the idea of "entity identification" (aka "named-entity recognition"). The idea is that your computer can scan a text (say, "Around the Equator") and automatically identify named entities--the names of cities, rivers, states, countries, mountain ranges, villages, etc. Just knowing that this kind of thing exists is a huge help. All I figured I'd need to do is to find such a service and then use it to pull out all of the entities from the text. My plan at this point was just to filter them by kind, merge duplicates, clean the data a bit, and I'd be done. But things are never quite this easy. which leads to a number of online services that will run an entity extractor over the text. You can see that I downloaded the fulltext from Gutenberg onto my personal web server (dmrussell.net/docs/Twain-full-text-Equator-book.txt) and handed that link to Alchemy. I thought that this would be it--that I'd be done in just a few moments. But no. Turns out that you can't just hand Alchemy a giant blob of text (like the entire book), but you have to do it in 50K chunks. That is, I would have to split up the entire book (Twain-full-text-Equator-book.txt) into a bunch of smaller files, and run those one at a time. Since the entire book is 1.1Mb, that means I'd have to create 22 separate files, each with 49,999 bytes. I happen to know that Unix has a command called split that will do that. I used the split command to break it up into 22 files and I moved those all back out to my server. Which would give me a big file with all of the entities in it. But I didn't want this to turn into a programming problem, so I looked for a Spreadsheet solution. 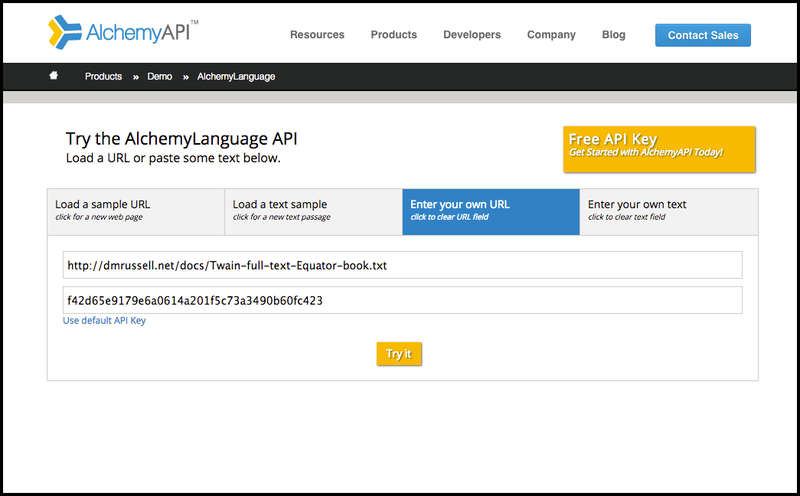 where url is the URL of the AlchemyAPI and xpath is an expression that says what you're looking for from the result. tells Alchemy that I want for it to pull out all of the "RankedNamedEntities" in the text file that follows. is the name of the file (neatly less than 50K bytes long) that I want it to analyze. Here's my spreadsheet (but note that I've hidden my APIKey here). You can see the "Alchemy base url:" which is the basic part of the call to Alchemy. Remember that the spreadsheet function ImportXML takes two arguments--the first is the URL to call Alchemy (which has the link to the file built into it) and an XPath expression. and found a nice little intro to XPath. Turns out that it's a kind of language for reaching into XML data and pulling out the parts that you want. (It took me about 15 minutes to read up about XPath, and then figure out that all *I* wanted was to pull out the entities from the XML that's being imported. In short, all I needed was the XPath expression: "//entity" as the second argument. I did this same thing 22 times, one analysis for each of the 22 sections of the book (Twain-part-aa through Twain-part-av). Then I copy/pasted all of the results into a single (new) tab of the spreadsheet. I used paste-special>values so I could then do whatever I wanted with them. That new page of the spreadsheet looks like this. Here you can see that I've already deselected "Crime"-- so all of the "Crime" entities will be filtered out of the list. This list now has 567 placenames in it, many of which are duplicates. To create a new list of only the unique names, I'll use the =Unique (range) function to create another tab in my spreadsheet with the unique names. Now we have 283 unique entities. So we still have some data cleaning to do. But this is point at which we need to do some spot checking to see how accurate the process has been. As is clear, it has included a few extra "place names" that aren't quite right. This is called a "false positive." By my count, the false positive rate is around 3% (that is, out of the 283, I found 8 clear mistakes). And that makes me wonder, how many "false negatives" are there? That is, how many place names does Alchemy miss? There's no good way to do this other than by sampling. So I choose a section out of the middle of the text (Twain-part-ak, if you're curious) and manually checked for place names. 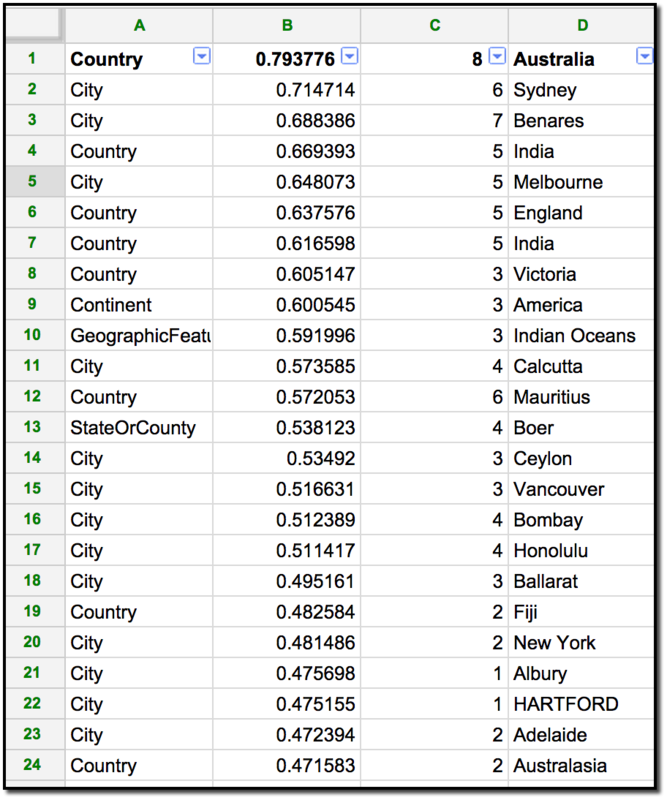 I found about a 5% false negative rate as well... (including cities that should have been straightforward, like "Goa"). So this approach could be off by as much as 9 or 10%. Still, this isn't bad for a first approximation. But there's more work to be done. In tomorrow's installment, I'll talk about some of the other approaches people used in the Groups discussion. There are always tradeoffs to make in these kinds of situations, and I'll talk about some of those tomorrow as well. Creating a map with all this data? That's Friday's discussion. See you then. Want to be Google Books wizard? If you're in Mountain View on 9/23/14, you can take my (free) class at the Plex. It starts at 6PM, runs till 7:30, with dinner (free!) to follow. Feel free to pass around to folks you know in the Mountain View / Palo Alto / Santa Clara / Menlo Park area that might have an interest in this. I'm back from vacation... and trying to catch up with your work! 1. You guys worked really hard on this! I see lots of evidence of people putting out ideas, other people testing them, and then other people doing some work, and generally building atop each other's investigations. This is superb, and exceeds my wildest expectations. Thanks. 2. This is a really hard problem. I started working on it yesterday, and it's taken me about 4 hours thus far. (Including dead ends.) But I see the end, and it will come it at around 5 hours to complete. (Not counting the writeup.) It won't be perfect--there will be places mentioned in the text that will be missed--but we should be able to get pretty good accuracy. Details tomorrow. To slightly complicate things, I had a great time on my vacation. Turns out the resort did have Wifi, but it was a bit spotty; trying to do any real work would have been crazy-making. The good news is that the South Pacific was fantastic. And the bad news is that the moment I got home I was hammered with a bad case of the flu, so I'm barely functioning. My solution won't be as clean and beautiful as I would have liked, but it'll be there. Dan enjoying the surface interval between dives. 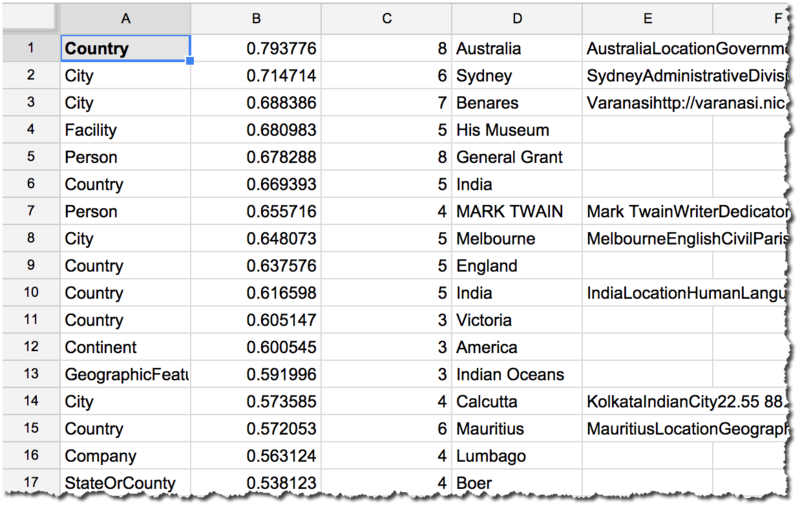 Search challenge (9/3/14): Can you find the places Twain mentions in "Around the Equator"? As I mentioned in my last post, I'm about to head out for a few days of SCUBA diving in an exotic, tropical (and undisclosed) location. Who knows? I might want to use some of things I pick up there as future Search Challenges! This week's Challenge is one that I've wanted to do for a while, but never quite had the time (or nerve) to post it as a Challenge. It's fairly tricky, and will require some new skills on the part of Search Researchers. But I'm confident that you can do this. Background: I remember reading Mark Twain's Following the Equator as a schoolboy and completely enjoying the story. I was also amazed at all of the places he visited. I know he made it to Hawai'i and Australia, but he also seemed to visit much of the world... and in 1895. By ship. Suppose I want to do his trip over again. Where all would I have to go? Challenge 1: Can you figure out all of the place names he mentions in the book? 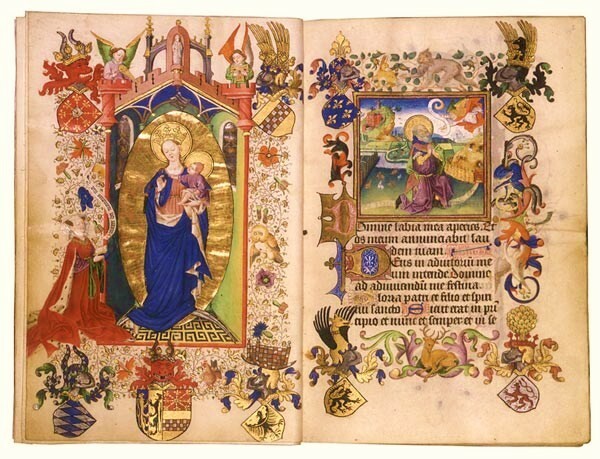 The link above is to the Gutenberg Project's plain-text version of his book. Can you figure out some way to determine ALL of the place names he mentions? "The starting point of this lecturing-trip around the world was Paris, where we had been living a year or two. We sailed for America, and there made certain preparations. This took but little time. Two members of my family elected to go with me. Also a carbuncle. The dictionary says a carbuncle is a kind of jewel. Humor is out of place in a dictionary." In these paragraphs he mentions "Paris" and "America." Those should be the first two entries in your list of placenames. Now, can you figure out ALL of the OTHER places he mentions in the course of the text? Obviously, you don't want to do this by hand. So the question really is, can you find a way to solve this problem using SearchResearch methods? Challenge 2: In case anyone finishes this early... Can you then create a set of Placemarks on Google Earth to show all of the places mentioned in your list of placenames? Ideally, you should give us a link to your KML file with all of the places Twain mentions in the book. As mentioned, I'll be out-of-town for the next 10 days, so we won't have a Challenge next week (Sept 10). Instead, I'll write up my solution on Wednesday, Sept 17th. So I set up a Google Group for everyone to discuss this Challenge. For this problem, we can have our discussion in SRS Discusses Around The Equator. (Click on that link to join the group.) This way, I won't need to manually approve every comment to the blog (which is what I do now). As I said in the Welcome message for the group, this is a no-hold-barred Search Challenge. If you want to work together, be my guest. You can set up Hangouts to meet and chat about possible solutions, you can swap ideas about how to solve it... Whatever works for you. It's a two week Challenge. Are you up for it? Can Team SearchResearch do it?